Abstract: The Raidmax LP6100E 500W power supply is ATX 1.2 compliant, and doesn't come with anything other than a power cord. Buying a power supply is actually more difficult than most people would think. With the growing demands of modern computers, it would be a huge mistake for users to simply pick up the cheapest generic unit they can find. Do that and you'll definitely be sorry when the PSU blows or your system fails due to inadequate or inconsistent power. You've probably heard me sing the same tune many times, but I still get a ton of people writing me with their horror stories. In fact we conducted a survey earlier in the year and power supply-related problems were the biggest issue! Check it out yourself in our Beginners Guides: Most Common Ways to Kill a PC. It's a fun read and I hope you learn a thing or two at the same time. 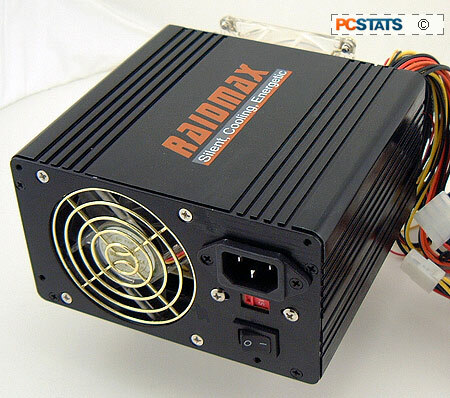 Today, PCStats will be checking out the RAIDMAX LP6100E 500W power supply. Does a quality PSU lie under the "nifty" black aluminum casing? According to the specs on the sticker, the LP6100E should be able to handle the power needs of even the most demanding computer on the market, but I think Raidmax is wearing rose coloured glasses on that front. 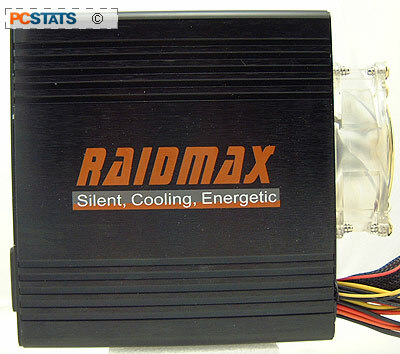 The Raidmax LP6100E 500W power supply is ATX 1.2 compliant, and doesn't come with anything other than a power cord. Given the number of Serial ATA drives on the market, it is surprising to see that RAIDMAX doesn't at least include a couple molex-to-Serial ATA adaptors. The unit retails for about $60 CDN ($49 US), which is rather inexpensive for a true 500W powersupply. Composed of two extruded aluminum sections, the main body of the power supply looks great, but the end caps seem to remind me of cheap OEM heatsinks, being rough and poorly finished. The power supply is anodized black, and uses two transparent 80mm fans arranged axially in an intake and exhaust configuration. Oddly, the intake fan sits on the outside of the case, perhaps hinting at a savings in material for the manufacturer. Both fans have nice wire grills protecting them from errant wires or fingers. Both fans draw 0.10A and are made by an unknown manufacturer called Yate Loon. Quality and lifespan are anyone's guess, but the fans were pretty quiet in operation.